Pop the popcorn and put in a super large bowl. 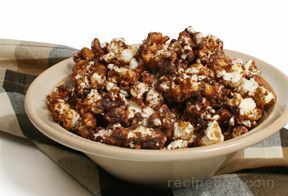 In a saucepan combine the marshmallow, caramels, and butter. Slowly melt, stirring occasionally. 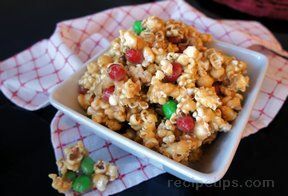 Pour caramel mix over the popcorn and mix well. 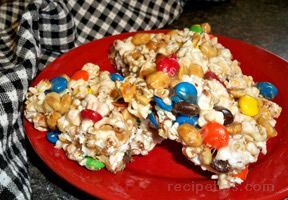 Stir in nuts and M&M.s. Press into a well buttered bundt pan. Cool until firm. Flip over onto a plate and cut into slices with a serrated knife. 16-18 servings.